(Photo: REUTERS / William Hong)A nun (L) holds an adopted child in the Qingyuan Buddhist nunnery in Quangang, Fujian province, August 27, 2014. 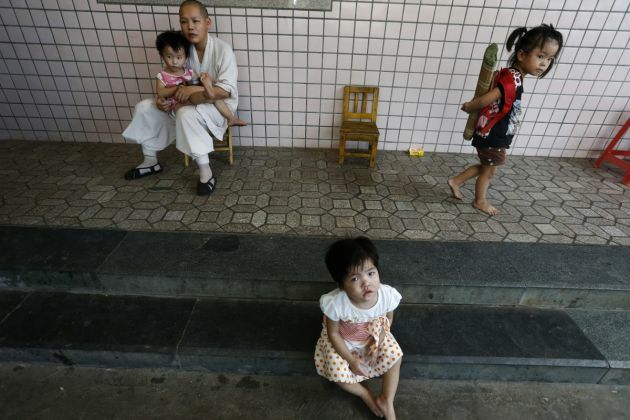 The Qingyuan Buddhist nunnery in Quangang has in years adopted 26 orphans, some of whom were abandoned with diseases, according to local media. Buddhist monks in China have drawn public ire after accusations of accepting money in exchange of blessing a businessman's high-end sports car. Blessing cars has become a fad in China, where monks bless expensive property and other material items in exchange for cash. What caught the public's eye recently was an incident involving a businessman and a luxury sports car he had just bought, Britain's Daily Mirror newspaper reported on August 13. Anger grew across the country when IT chief Tao Hung asked Buddhist monks to bless his Porsche sports car. Tao said he sought the blessing from the monks so that no harm would befall on him when he was driving. He also sought the blessing so he would be lucky enough to reach his destination on time and without any incident. Critics online criticized Tao for seeking such a blessing, saying it was unnecessary and pointless. For instance, one commentator said if Tao wanted to arrive safely to his destination, he should exercise caution in driving along the road. Another noted that if the owner wanted to avoid accidents along the road, he should drive and defensively, rather than storming the heavens. "He may have money but one wonders how he came to make it, given the fact that he shows an eminent lack of intelligence," one wrote in an online post, referring to Tao. Sought for comment regarding the issue, the businessman declined to comment on the matter. For their part, the monks said there was nothing wrong with the act, pointing out that putting a blessing on a means of transportation such as cars has always been a part of Buddhist tradition.